A closure tape for sealing seams on all types of housewrap, sheathing, insulation and vapor barrier materials used in residential and commercial construction applications. 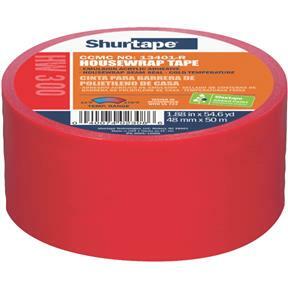 CCMC-Certified HW 300 can be applied in vast temperature ranges and in humid conditions, and combines the high shear and permanent hold you expect with a solvent-free, water-based, permanent adhesive that has a less astringent smell than many solvent-based sheathing tapes - a refreshing change for a long day on the jobsite. 2-3/8" wide by 72 yd.